ANVER’S standard lifting frames are built to order using modular components, so there are hundreds of possible combinations depending on the vacuum generator, beam, crossarms and vacuum cups selected. 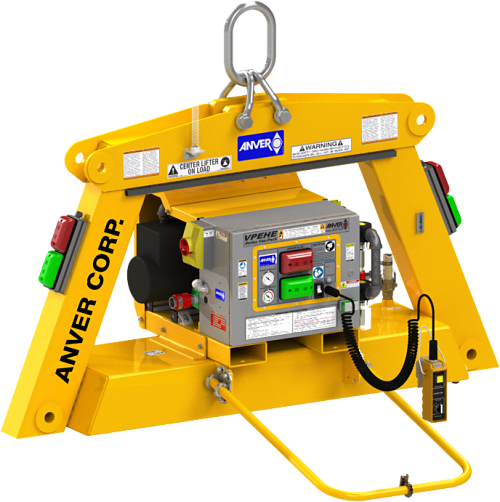 ANVER Vacuum Lifters comply fully with and meet the standards of US ANSI ASME Standard B30.20 for below-the-hook lifting devices, as well as complying with OSHA and most European requirements. The LG2000M10-Series ten-pad lifting frames are ideal for handling carbon steel and stainless steel sheets, plates and non-ferrous materials like aluminum with a capacity up to 20000 lb (9072 kg). The type of vacuum lifter – Mechanical, Electric or Battery – paired with the number of pads used will depend on your application needs. Lifting frame shown with vacuum generator and/or optional accessories, which are sold separately. Unit weight does not include vacuum generator or optional equipment (Parking Stands, etc). 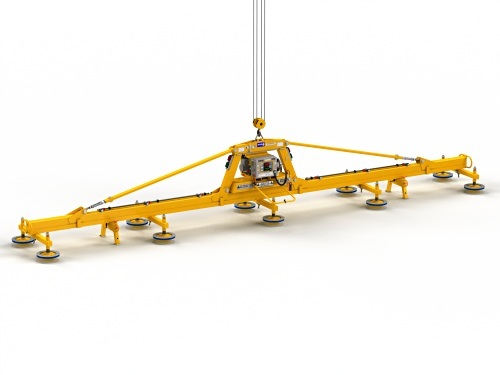 To calculate total unit weight, add the compatible generator weight to the lifting frame weight and deduct it from crane capacity. NOTE: Additional crossarm lengths available for handling wider load sizes. Contact ANVER Application Engineers for more information. Fully welded rigid frame makes the load handling stable via a high hook point. Reinforcement bracing provided on longer length lifting beams. The GF-Frame includes a main vacuum reservoir as a primary with a secondary reservoir running the entire length of the spreader beam. Resulting in near instant attach time, maximizing productivity. Front handlebar and end of beam tag line loops provided to facilitate maneuvering. Vacuum pads swivel and feature top & bottom springs to handle wavy plate. Bolt-on sealing rings feature rugged seals that can be replaced easily. This can be done in minutes with the lifter resting on its parking stands (Sold Separately). Standard modular construction allows quick service and/or replacement of Vac-Packs, as needed to minimize downtime. *Minimum Load Sizes are with outer vacuum pads shut-off. (1/5 rated load) Load capacities at 24 in. Hg, Sea Level. **Battery powered vacuum generators are only recommended when handling non-porous loads. Crossarms and vacuum pads in maximum position to handle maximum plate size. 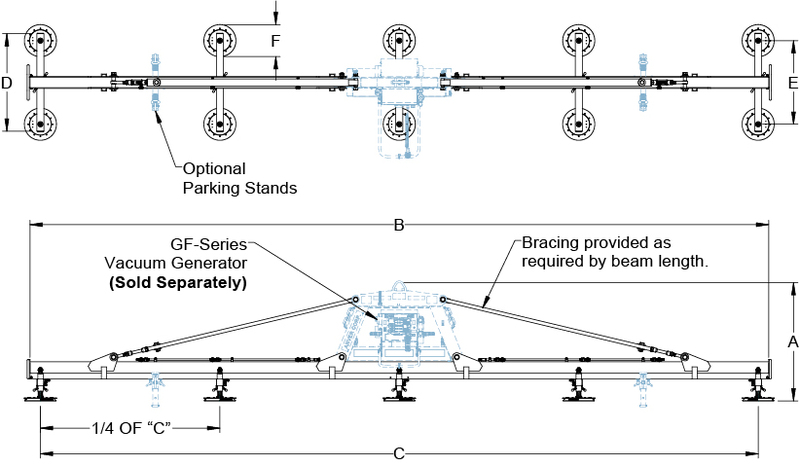 Crossarms can pivot to parallel with spreader beam to handle narrow plates. Crossarms adjustable to handle short and narrow plates. Inner crossarms (3/5 capacity) for use with smaller plates. Outer crossarms provided with shut-off valves. Inner crossarm (1/5 capacity) for use with smaller plates. Outer crossarms provided with shut-off valves.